manner of tourists with no concept of art, one of them said he was going to look for the bathroom, and he walked off, walked past me, into the Bordone Room, almost bumping into Irrsigler, who stopped to look at the man as he entered the Bordone Room, looking around for something, turning around and then stopping in front of the Portrait of a White-Bearded Man, Reger noticed the man and asked him to sit down on the bench next to him and asked the man where he was from, and the man introduced himself as Tony and said that he was a blogger, a literary blogger, I can’t stand bloggers, failed writers who fail to see that they are failed writers, said Reger, literature, well literature I like even less, especially contemporary literature, writers today, especially here, in Austria, are tedious, they are tedious people writing tedious attempts at novels, and the man, this Tony, smiled nervously and said he’d actually just been reading a book by Thomas Bernhard and, and Bernhard is the worst of them all, said Reger, a tedious, repetitive writer, a writer who repeats himself all the time, Bernhard’s work is typical of the culture of this wretched country, said Reger from his bench in the Bordone Room, as Irrsigler completed another round of his rooms, as I observed, as the large bus waited outside the museum, a tedious collection of words which are meant to be insightful, but which, in fact, are merely laughable, and Tony, obviously feeling uncomfortable, asked Reger if he preferred art to literature, not at all, I loathe all of these so-called Old Masters, these so-called geniuses, flawed every one of them, this museum is full of paintings, world-famous paintings, but, in truth, this museum is laughable, there isn’t one single worthwhile piece in the whole building, in fact, said Reger, this whole tedious country is full of worthless pieces of so-called art, all of which belong on a dung heap, rotting with all of the other manure in the garden, all of it, and, said Reger, pulling on Tony’s sleeve to prevent him from leaving, the worst thing is that the people come here and enjoy this manure, they think this is great art, when it’s nothing more than laughable, said Reger from his bench in the Bordone Room in front of Tintoretto’s Portrait of a White-Bearded Man, but you must like Vienna, said Tony, looking around nervously, it’s such a beautiful city, so many beautiful buildings, they might look beautiful, but if you look at them carefully, said Reger, if you really examine them, they are all simply tedious, monstrous blocks of concrete, and the people, the Viennese people, they are simply laughable, awful, awful people, but the people who live outside Vienna are even worse, tedious people incapable of producing a thought of their own, and yet outside Austria things are even worse, in England, for example, at which point Tony ran screaming from the room, observed by Irrsigler, who was completing another of his rounds, and I watched as the rest of the bookish-looking people quickly left the museum, and the large coach drove off a few moments later, and I turned back to the Bordone Room, where Reger was talking to Irrsigler, an Englishman who was talking about that tedious Bernhard, I find people who think they can write about literature laughable, what manure they come up with, how tedious they really are, said Reger, and I decided, writes Atzbacher, that I couldn’t be bothered waiting any longer and that Reger had always been a bit of a prick, so I left the museum and went down the pub for a beer instead. The beer was awful. Sentence of the month, right there, tedious as it is. Oh what at tedious review. I'm not even sure why I bother commenting on it as I'm overwhelmed with how pointless it all is. 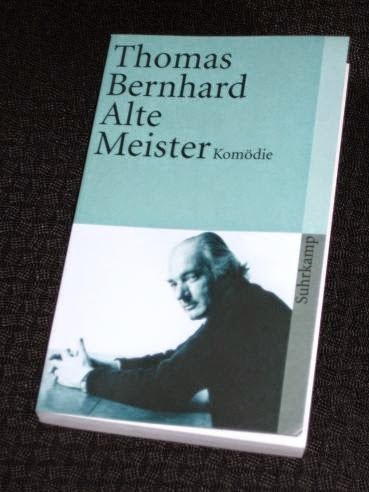 I really must read some Bernhard, I need cheering up.